the LotFancy wrist blood pressure monitor with portable carry case is convenient for use at home, in the office or even on the go, allowing you to check your blood pressure anywhere, anytime and still get the precise readings you need. 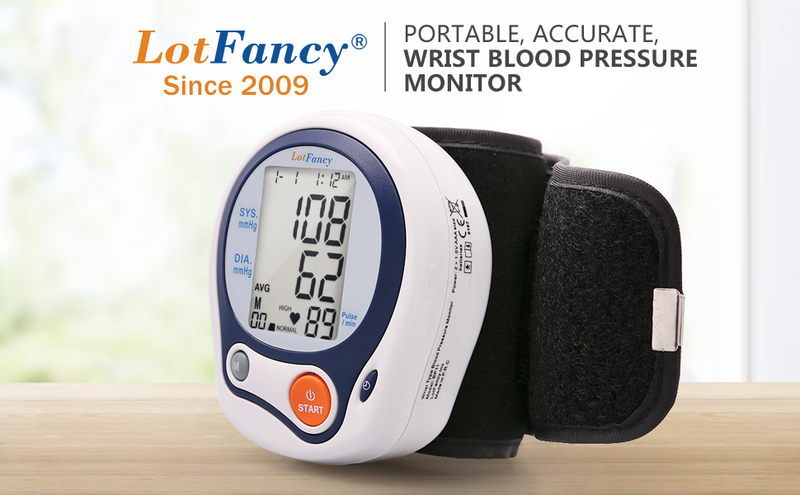 LotFancy automatic wrist blood pressure monitor is highly recommended by customers and health experts, gain portability without compromising accuracy. Records and stores up to 60 readings for 2 different users with time and date stamp. Adjustable wrist blood pressure cuff is comfortable for a wide range of adult users, fitting 5.3 to 8.5 inch wrist circumference. Compact design, the portable wrist bp monitor allows you to track your heart health on the go. LotFancy, founded in the United States since 2009, is an e-commerce company specializes in providing top-notch health care devices, consumer electronics and outdoor products. The LotFancy Digital Wrist Blood Pressure Monitor Cuff is another premium quality health device that have been tried and tested by thousands of customers. If you have any questions, please fill in this form. Or you can drop us an email at support@smartlivingbox.com. Copyright © 2019 Smart Living Box.